Analysts from Kantar Worldpanel have the mobile OS market share numbers for Q1 2016 and they show the largest growth of Android in two years. Google's mobile OS grew by 7.1% points to 75.6% in the EU5 (UK, Germany, France, Italy, and Spain). 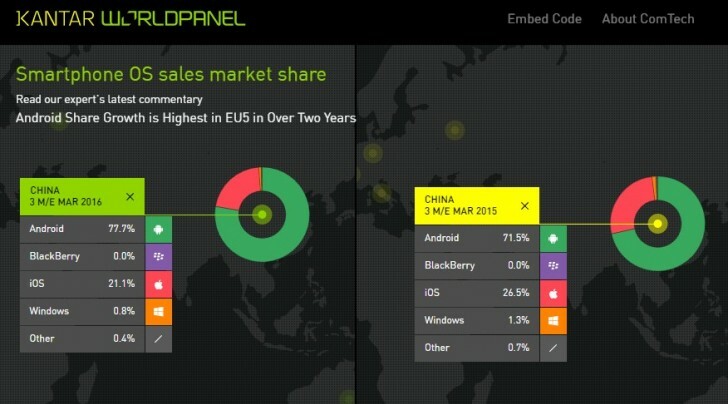 In China, Android rose nearly 6% points to 77%, while in the US its market share is 65.5%, up by 7.3% points. Lauren Guenveur, a mobile analyst for Kantar Worldpanel, says that Android's growth comes not just from one or two players, but from different brands and ecosystems, which vary from region to region. Apple, on the other hand, isn't doing so well in terms of market share. In the EU5, the company declined from 20.2% to 18.9% in the three months ending March 2016. In fact, nearly 3.3% of new Android users came from iOS. In China, iOS continued to decline to 21.1% in the three months ending March 2016, down from 26.1% in the same period from a year ago. Android share could also be negatively affected by high demand for the Apple iPhone SE. iPhone SE sales will be particularly important in China, where success in the mid-tier will determine the top player in the region. These factors should play out further in the next quarter. However, Microsoft is counting the most losses, as the Windows Phone sales dropped 5% points year-over-year to 4.9%. Nearly 7% of new Android customers came from Windows Phone. Dominic Sunnebo, business unit director for Kantar Worldpanel ComTech Europe, says that Microsoft lost most of its market share to Android in the traditionally strong Windows Phone markets such as Italy and France. There, 10% of them switched to Android in Q1 2016 opting for brands like Huawei, Wiko, and Asus. Android’s gains in the US came from growing sales by Samsung, Motorola, and LG. Typical android users Â– cheering about other mobile OS market shares falling. I guess this is the only way they can justify their choice. "Nearly 7% of new Android customers came from Windows Phone" Well - when all is said and done then Microsoft can brag about that there once was actual people using the Windows Mobile OS.